Artist Jewelry Chris Steenbergen gold and silver brooch: Description by Adin Antique Jewelry. This 18K red gold and silver brooch by the well-known Dutch contemporary jewellery artist, Chris Steenbergen, serves as a collectible piece of future antique jewellery. 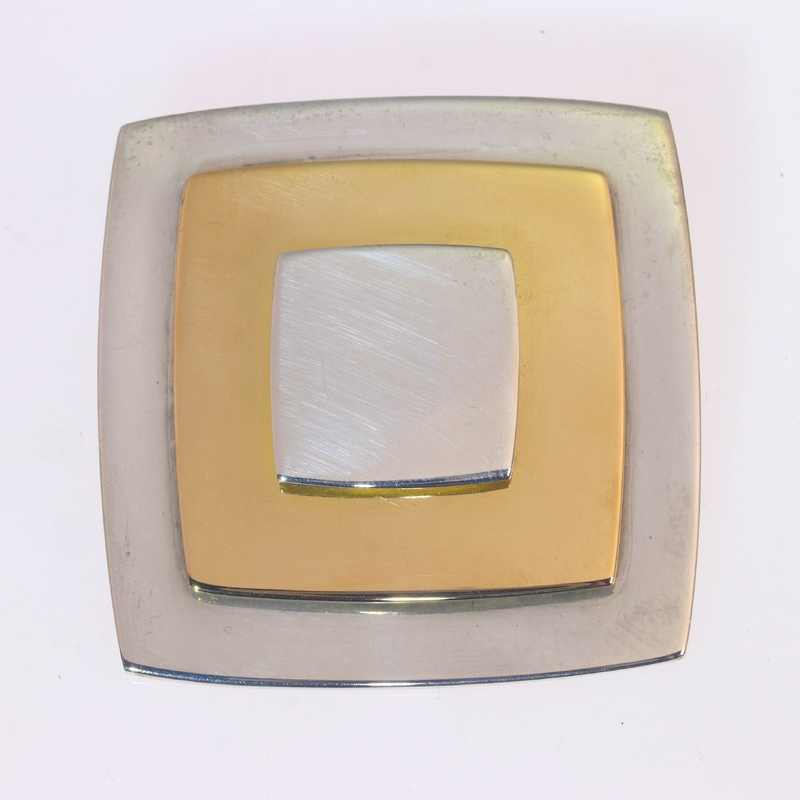 One gold square is placed between a smaller and bigger silver square plaque. Being a polished piece of minimalistic abundance of colour and shape, this jewel is a wearable statement. Upon the purchase of this jewel, we will add the (Dutch) booklet 'Chris Steenbergen' by Marjan Unger (Stichting Fonds BKVB, Amsterdam, December 2000). Antique jewelry object group: brooch (artist jewelry) - This jewel was part of a private collection which we were lucky enough to be able to purchase. Material: Two layers of silver and one layer of 18K red gold. Extra information: Chris Steenbergen (1920-2007) is one of the few well know Dutch artist jewelers goldsmith silversmith in the second half of the 20th Century. Participated in many exibitions in many countries and is mentioned in many books on contemporary jewelry art. A more extended explanation on his live and works are to be found on our Chris Steenbergen glossary page. Our complete collection of: Chris Steenbergen jewelry. Hallmarks: The Dutch control mark representing a tulip with the number 750 for 18K gold. In use since 1953. The Dutch control mark representing a sword with the number 925 for silver 925 (Sterling silver). In use since 1955. And Chris Steenbergen's master mark.